Can’t open CAD DWG file? With the help of the tool—VeryPDF AutoCAD to PDF Converter, you can convert DWG to PDF and view the PDF instead. 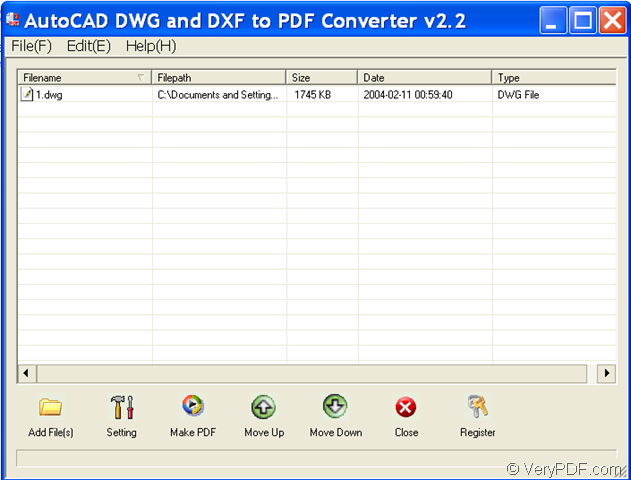 DWG is a binary file format created by CAD (Computer Aided Design) applications, which is used industrially by architects, engineers and designers for 2D and 3D drawings. DWG file contains vector image data (provides instructions to the CAD application about how to display the DWG on screen) and metadata (contain a variety of information on the file including location specific data and also client data). PDF is a file format developed by Adobe Systems for representing documents independent of operating system, application software or hardware. A PDF file encapsulates a complete description of a 2D document that includes the text, fonts, images and 2D vector graphics that compose the document. VeryPDF AutoCAD to PDF Converter is able to DWG and DXF to PDF without the need of AutoCAD. In addition, it allows you to change the color of the original DWG drawings into black and white, gray or 256 colors. Free download VeryPDF AutoCAD to PDF Converter and install it on the computer. After launching the application, you can see its main interface on the screen like the following snapshot. To add DWG/ DXF into the application, you can directly drag and drop the files into the application or click button Add File(s) at bottom of the main interface to open the file picker window in which you can choose files. To set output color, you need to click button Setting at bottom of the main interface, and then click the second tab Base Setting at top of the popup window to switch to the “Base Setting” interface. 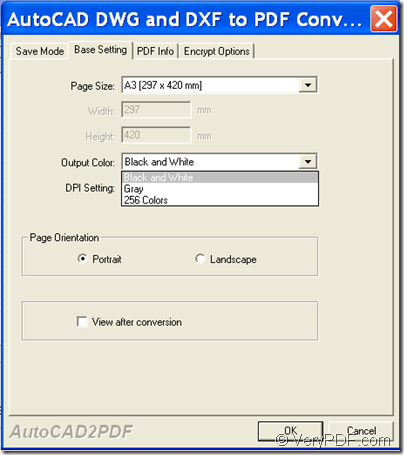 In the drop-down box of “Output Color:”, please choose Black and White if you want to get black and white PDF. If you want to create gray PDF, please choose Gray. 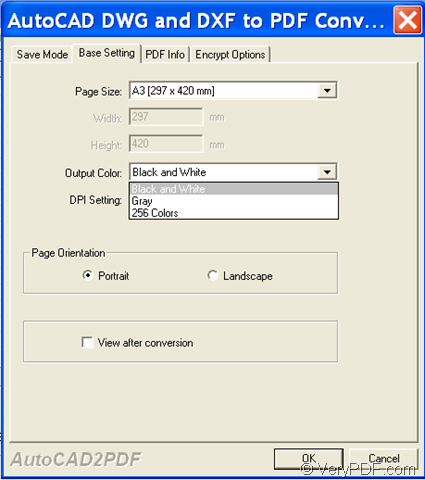 If you want to make color PDF, please choose 256 Colors. Please see it in the following snapshot. After the setting, please click the button OK to enact the setting and go back to the main interface. Then, please click button Make PDF at bottom of the main interface , and then edit a name and choose an output folder for the created PDF. The following snapshots show the conversion results. If you are interested in this application, you can get VeryPDF AutoCAD to PDF Converter here. 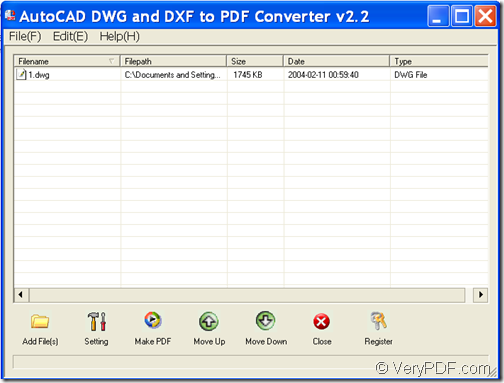 How to convert PDF to DWG or DXF in batch? This entry was posted in AutoCAD to PDF Converter and tagged dwg to pdf. Bookmark the permalink.